U.S. Senate Republican Leader Mitch McConnell of Kentucky. A week before the state's primary election, the three candidates took part in one of the most contentious debates among several held recently across the state. Morrisey accused Jenkins of having a liberal background and said his past stint as a Democrat should make voters wary. After switching to the Republican Party, Jenkins defeated 19-term Democratic Rep. Nick Rahall in 2014. Jenkins pointed out this is not Morrisey's first attempt at running for Congress, noting a failed 2000 attempt in his native New Jersey and a Morrisey campaign advertisement saying he'd fight anyone who goes against New Jersey values. "You know what? We need somebody representing our values," Jenkins said. "People need to be coming to West Virginia for the right reasons." Morrisey replied, "West Virginians wants someone with conservative values." Quizzed about his home near Las Vegas, Blankenship said he probably pays "more taxes than anybody on this stage to West Virginia." Blankenship served a year in federal prison for a misdemeanor conviction related to the 2010 explosion at the Upper Big Branch mine that killed 29 men in southern West Virginia. When asked about Justice Department special counsel Robert Mueller's investigation of Russian election interference, Blankenship, who has maintained his own innocence, provoked the loudest laugh of the night. "You know, I've had a little personal experience with the Department of Justice," he said. "They lie a lot, too." Three other trailing GOP candidates weren't invited to Tuesday's debate on Fox News. When asked whether they would support McConnell as Senate majority leader, none of the candidates raised their hands — Blankenship ducked behind the podium. Blankenship is at odds with McConnell, who he says is "spending millions to defeat me." Earlier Tuesday, Blankenship's campaign released a statement attacking McConnell. The statement referred to a 2014 magazine article alleging that drugs were found aboard a commercial cargo ship owned by the family of McConnell's wife, Transportation Secretary Elaine Chao. The statement referred to McConnell as "Cocaine Mitch," though the allegation didn't directly involve the senator. 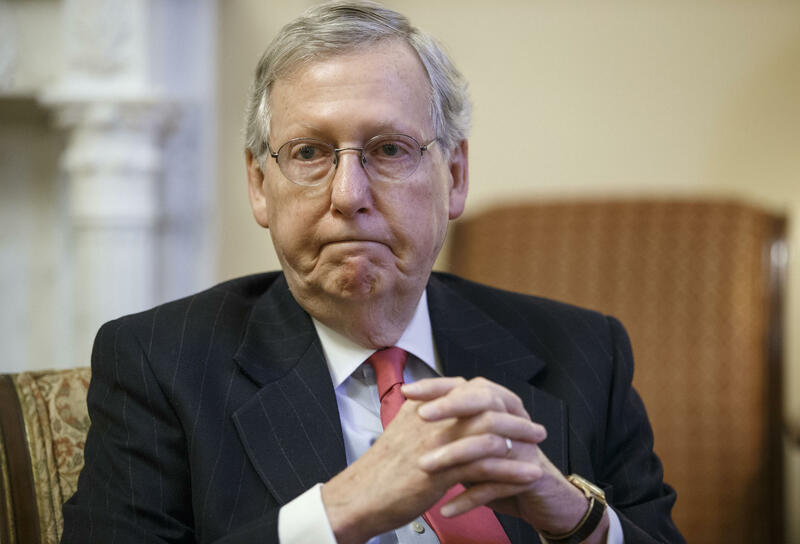 McConnell's office referred questions to the National Republican Senatorial Committee. Calls to the NRSC went unanswered Tuesday night.